There's a new member of the Hatchimals family and it's set to be one of the most popular toys this Christmas! This week we had a new arrival in our house in the form of of a Hatchimals Hatchibabies Egg! My seven year old has been nurturing and playing with the Hatchibabies egg all week and today she was very EGGcited to hatch it and meet her new best friend! 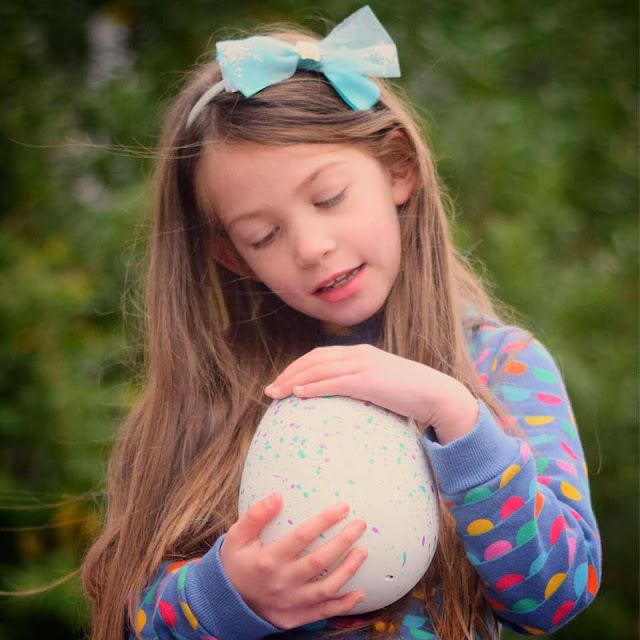 Elizabeth is a huge fan of everything Hatchimals so she was just EGGstatic to have the chance to receive her very own Hatchibabies. 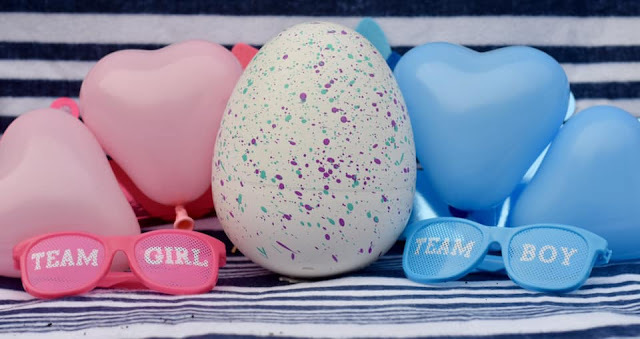 As an extra surprise with the latest addition to the Hatchimals family, you don't find out if you have a boy or a girl until it hatches! Just like with a real baby! 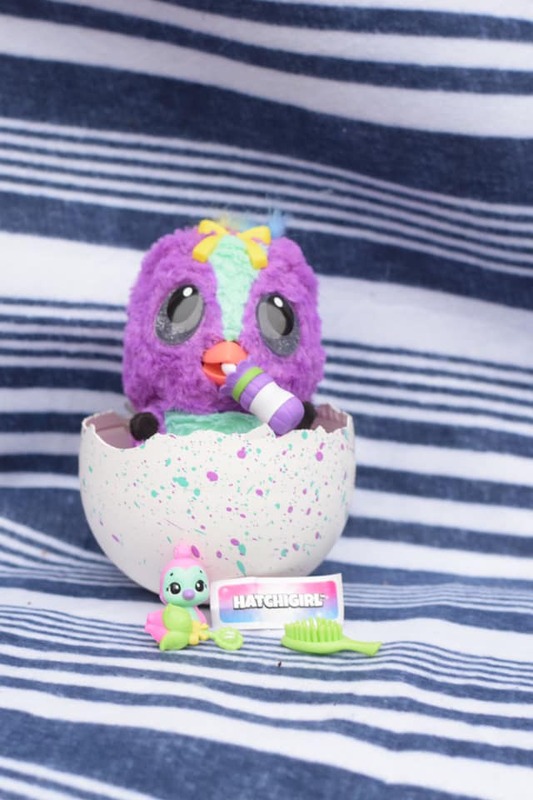 Hatchimals Hatchibabies are available in 5 Species, Ponette, Cheetree, Chipadee, Monkiwi and Koalabee. The latter three will be store exclusives! 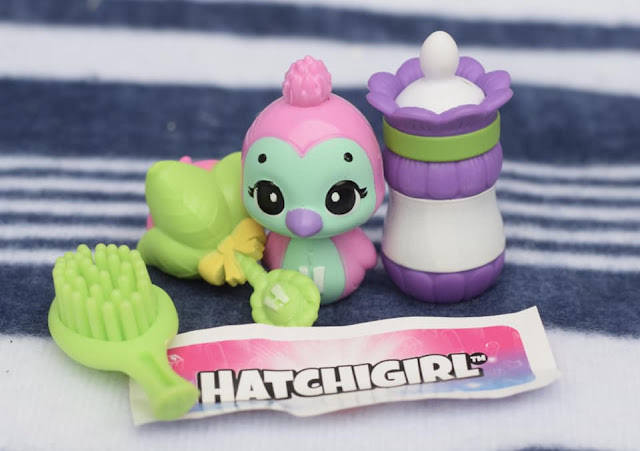 Each of the varieties come in both hatchiboys and hatchigirls versions, but you won't know which you have until your Hatchibaby has hatched! Can you Play with the Hatchimals Hatchibabies Egg before it Hatches? Yes! 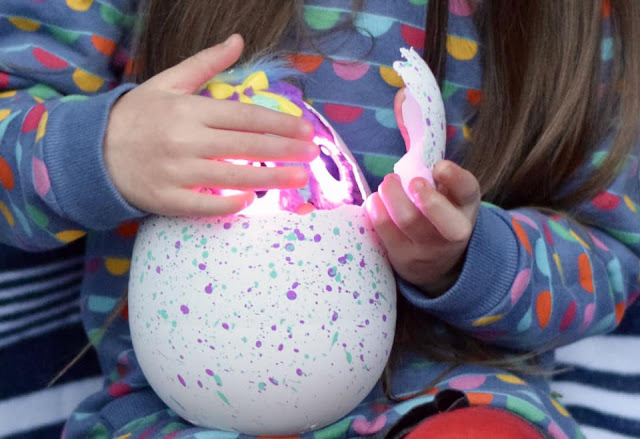 This year there is even more in egg play than with any any previous Hatchimals product. When you remove the egg from its box, you will need to remove the two plastic locks from the base of the egg. This will wake up the egg and it will be ready to play! If at any point during in egg play you need to stop playing just hold the egg upside down for 25 seconds and it will stop. Wake it up again when you are ready to continue by rubbing the base. Even before the Hatchibabies has hatched from it's egg, you will be able to see its eyes shining through the shell. Each of the eye colours indicates something different. Red Eyes - Upset - You need to rock the egg or rub the bottom. Orange Eyes - Gassy - You need to pat the bottom or tilt the egg. Yellow Eyes - Happy - Continue to care for the egg or try tilting. Green Eyes - Sick - Rub the bottom of the egg. Blue Eyes - Cold - Rub the bottom of the egg. White - Sleepy - Put in the egg base for a nap or give it the cuddle buddy. Pink - heartbeat - hold the egg still and listen. Eyes turned off - listening - tap on the egg. 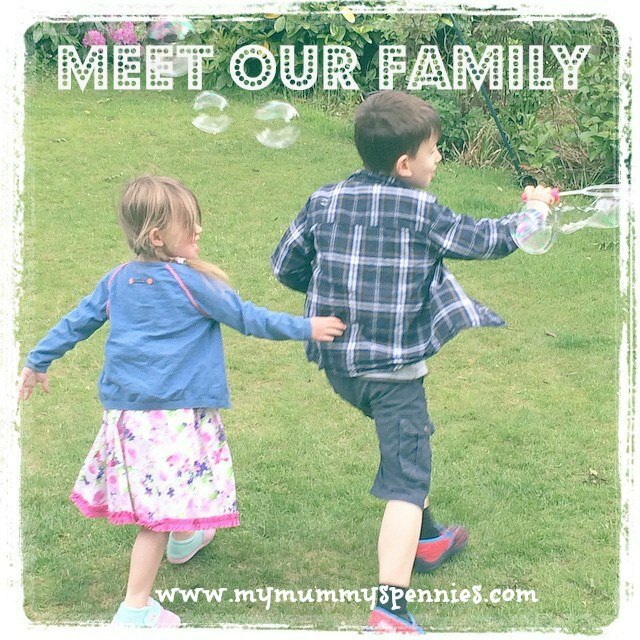 Elizabeth spent a lot of time playing with, caring for and talking to the egg before it had hatched, she loved how it reacted to her and cooed or rocked when she nurtured it. She thought it was especially hilarious when it burped! 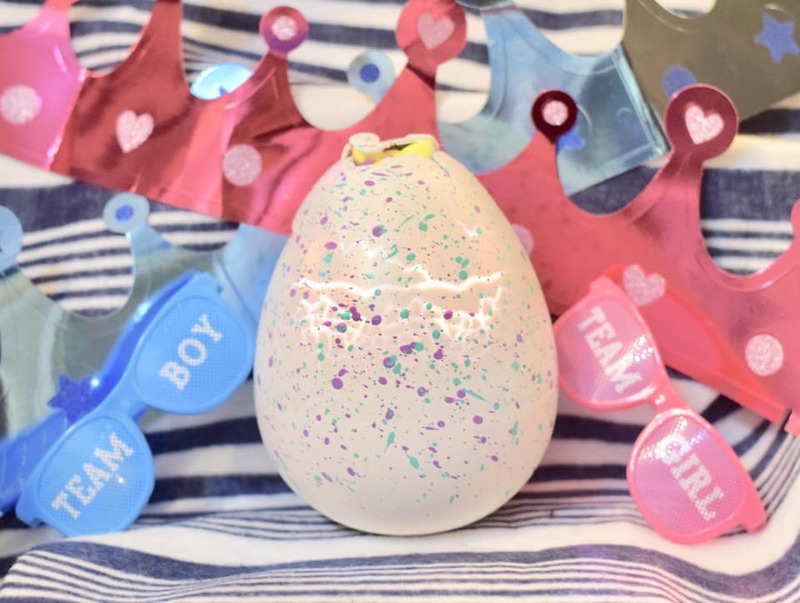 How do know the Hatchimals Hatchibabies is ready to Hatch? When the Hatchibabies eyes turn rainbow coloured (this means the eyes rotate through each colour) you know it's ready to hatch! To encourage hatching hold and rub the bottom of the egg. If the movement stops inside the egg and you hear tapping, respond by tapping back on the egg. If the egg stops and you hear your Hatchibabies panting, hold the egg to hear the heartbeat. You may need to help your Hatchibabies hatch by peeling back extra pieces of shell. When your Hatchibabies has finished hatching it will sing Hatchy Birthday! You can now remove your Hatchibabies from the egg. Keep the base of the egg a a nest for your Hatchibabies but dispose of the other shell pieces. Once you have hatched your Hatchibabies and given them a big cuddle, you should be able to see the gender quite easily from the colour of the fur, however if you're unsure, there is a secret scroll hidden at the bottom of your egg under your Hatchibabies, take this out to reveal if you have a Hatchiboy or a Hatchigirl! We hatched a girl Ponette! She has purple fur with a turquoise tummy and stripe and a yellow bow! She has a beautiful rainbow tail ans sparkly wings! Elizabeth was delighted as she was (not so) secretly hoping for team girl! 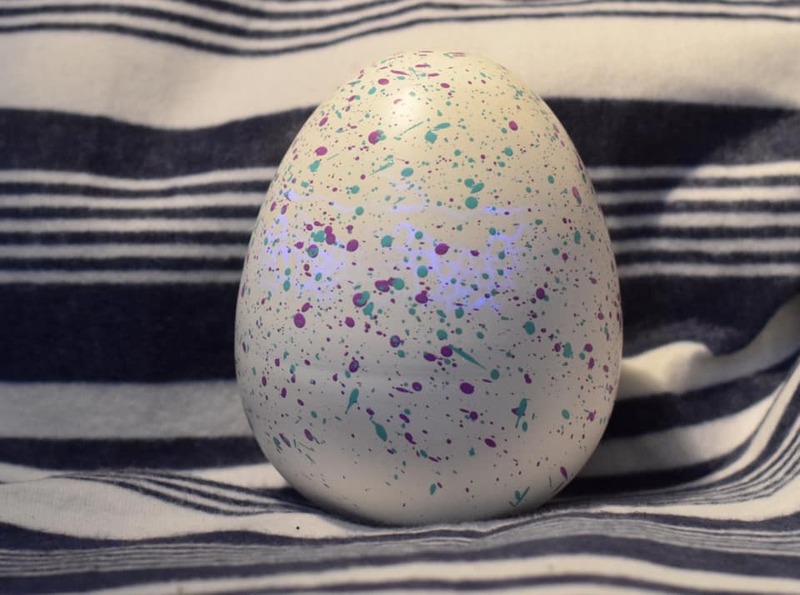 What's in the Hatchimals Hatchibabies Egg? As well the Hatchibabies itself, and the secret scroll mentioned above, your Hatchibabies comes with it's own special accessories just like a surprise toy! Once your egg has hatches you can open up the little surprise compartments to see which accessories your Hatchibabies comes with. 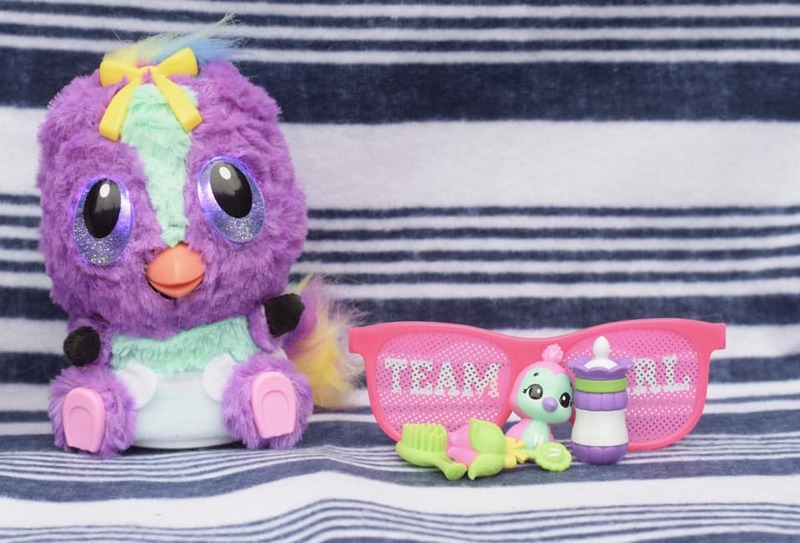 Our Ponette Hatchigirl came with a cute little brush for looking after her fur and grooming her, an adorable rattle with a 'H' monogram, her own bottle for feeding and a cuddle buddy in case she got lonely! In addition to this, the pink frame where the accessories were hidden, comes out and converts into your Hatchibabies' own highchair! You can also use the bottom of the egg as a little nest for your Hatchibabies to play or sleep in! Each Hatchibabies takes two AA batteries which are included and can easily be replaced when needed. 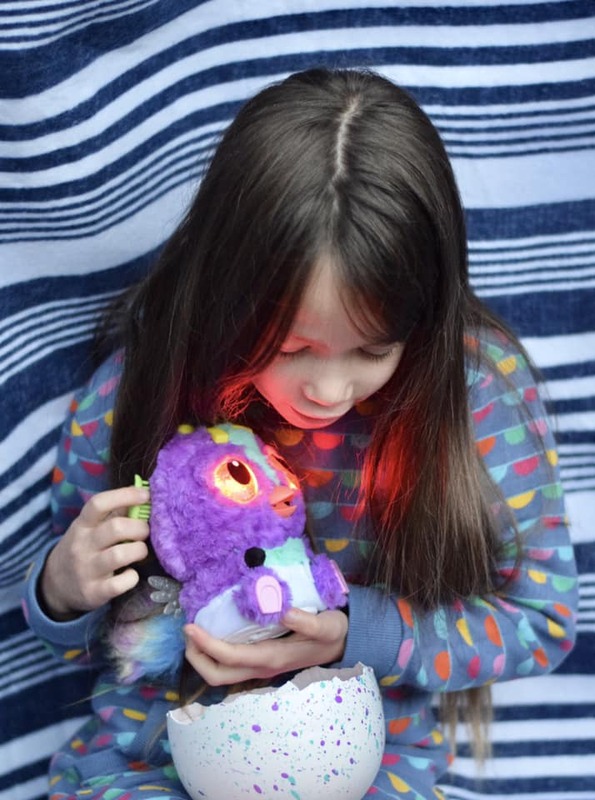 How do you play with the Hatchimals Hatchibabies once it has hatched? There has been so much though put into the development of the Hatchimals Hatchibabies. You have so much play value and aspects of different play in one toy! The accessories encourage you to look after your new Hatchibabies and care for it just like you would with a doll. You can use the bottle to feed it by popping the teat in between the beak and pressing down gently on the lower beak. Once your Hatchibabies has been fed, it may have wind and need burping just like a real baby so don't forget to hold her against your chest and gently pat the back of her head. You may hear a cheeky burp! The Hatchibabies will also respond to the other accessories, such as the rattle and the the Cuddle Buddy, to use these ensure that the monogrammed H faces you and then bring it to your Hatchibabies chest. The Hatchibabies is also a great interactive toy. Your Hatchibabies loves to sing and dance too, give them their rattle and they will show you their moves! Just like a real baby, your Hatchibabies loves to play games. You can play Peek-a-boo by covering it's eyes and it known two special games of it's own too! Animal Colours can be played by touching and holding the left foot for 3 seconds and then when you see the colour that matches the animal sound tap it's forehead. You win by getting 8 right! Bouncy Baby can be played by touching and holding the right foot for three seconds. When the music plays bounce your Hatchibaby backwards and forward, when the music stops, you stop - just like musical statues! 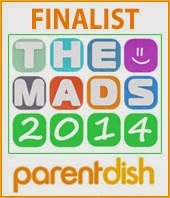 Get 3 to win! What do the different coloured eyes on the Hatchimals Hatchibabies mean? Red Eyes - Upset - You need to put the Hatchibabies in the egg base for a timeout or pet it. Orange Eyes - Gassy - You need to pat the back of its head. Green Eyes - Sick - Touch and hold the forehead to take its temperature and pet to comfort it. Blue Eyes - Sad or Scared - Pet it or give it the cuddle buddy. Pink - Cuddly - Pet its head or nuzzle its nose. 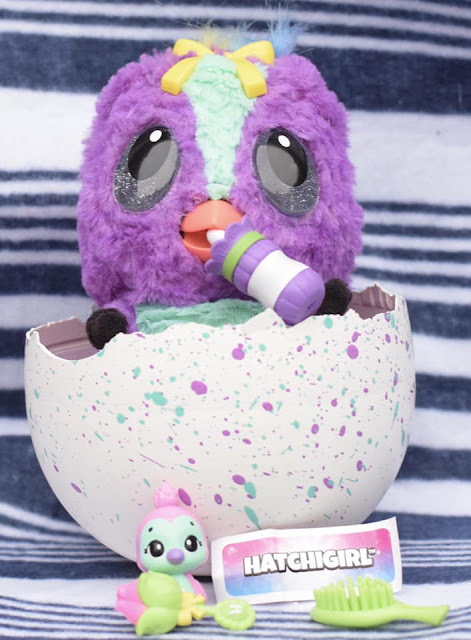 How do you get your Hatchimals Hatchibabies to perform their Secret Trick? You may have noticed earlier that there was something on the back of the secret scroll that revealed your Hatchibabies gender. This is a clue to it's secret trick! Each Hatchibabies species has a different one. To discover what your Hatchibabies secret trick is rub the back of it's head until it's eyes turn purple then tap the from and back of the head (either side of the bow) twice at the same time. Elizabeth's Ponette Hatchigirl played a cowboy song! 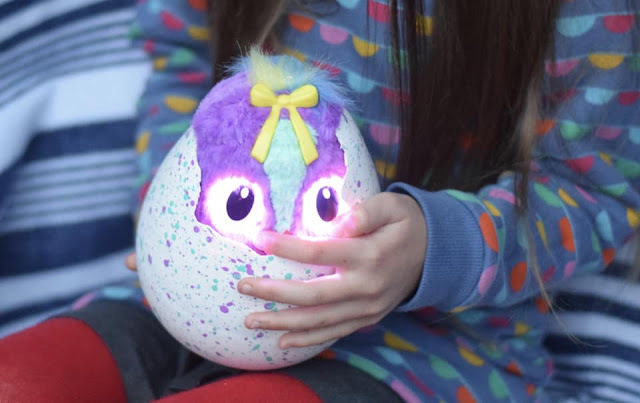 How do you turn Hatchimals Hatchibabies off? You may be having lots of fun with your Hatchibabies but sometimes both you and your Hatchibabies will need a rest. After two minutes of no interaction, your Hatchibabies will fall asleep. They can be woken again by touching the forehead or can be turned off fully by using the simple switch underneath. The two AA batteries can also be removed and replaced. If you need to turn your Hatchibabies off while still in it's egg - before it has hatched, simple turn it upside down for 25 seconds. 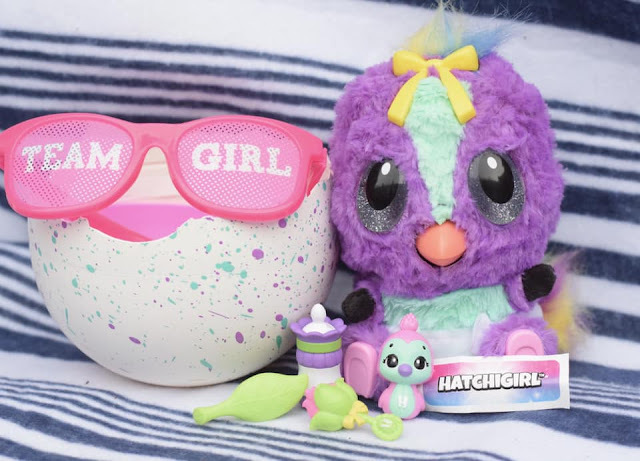 What did we think of the Hatchimals Hatchibabies? Elizabeth loves her Hatchibabies and gives it a huge thumbs up, she's really enjoyed caring for it and looking after it both inside and outside of the egg this week. 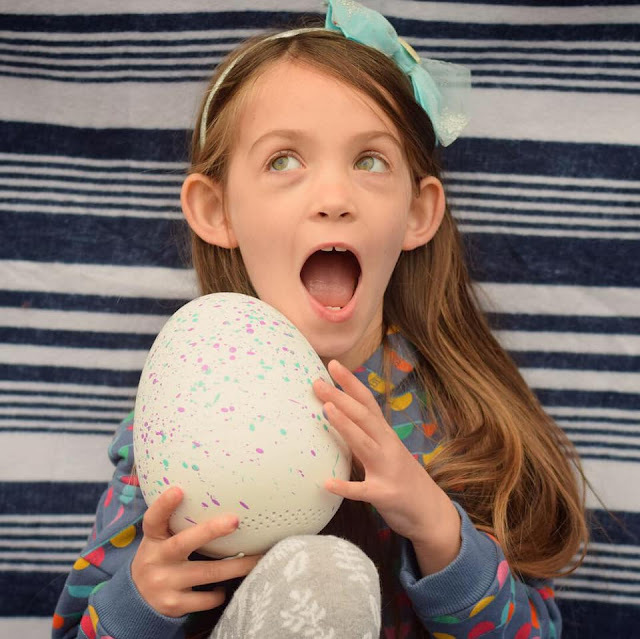 The gender reveal aspect really built up excitement for her and her face was full of joy when she hatched a girl. 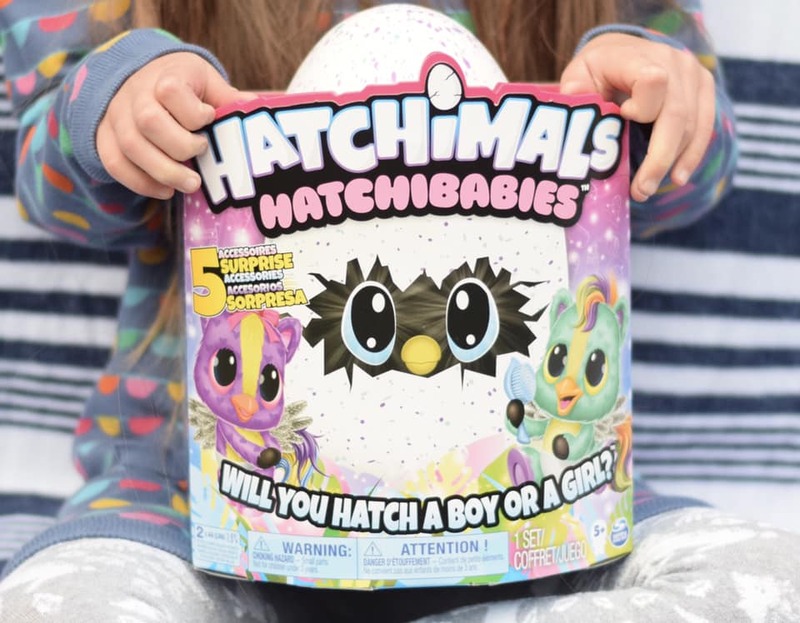 I do wonder about not being able predict what gender you are buying and whether this would disappoint some children if they don't hatch what they were hoping for. At an RRP of £59.99, it's a high value toy to not know exactly what you are getting. 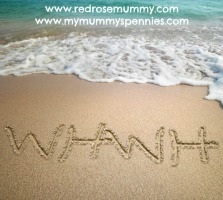 Surprise toys are all the rage however, and lots of children love that build up and anticipation! Sometimes toys like this are a great hit at first but don't have a lot of play value after the initial 'reveal' and are soon left to be ignored. The Hatchibabies has a variety of play options and the addition of cute accessories to help care for it so I can see it lasting much longer than it's predecessors. Hatchimals Hatchibabies are aimed at children aged 5+ and I think that's just about right for the amount of understanding you need to learn and play the games, younger children my enjoy it, but I don't think they would get as much out of it and the small accessories would be a risk for very young children. At almost eight, Elizabeth needed a little help understanding some of the instructions but is able to play with it independently. I can see the Hatchimals Hatchibabies being on the top of a lot of children's Christmas lists this year! For more Hatchibabies fun check out the Hatchimals website and #Hatchibabies on social media! We have been sent a Hatchimals Hatchibabies for the purpose of this review. All thoughts and opinions are our own.